At Eat’n Park we love Halloween. The leaves start to change. There’s a chill in the air. At Eat’n Park, we serve up hot potato soup (on Wednesdays and Sundays at least) and hot pumpkin chai lattes. 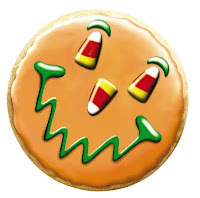 Best of all, our Halloween Smiley Cookie comes back this time every year. What could be better than candy corn on a sugar cookie! It gets our blood pumping. It’s not just us either (because we tend to like every shape Smiley takes). Halloween Smiley is our most popular special edition Smiley cookie. He’s been in a movie! He played alongside Emily Osment (Lily from Hannah Montana!) in “R.L. Stine’s The Haunting Hour: Don’t Think About It”, filmed right here in the ‘burgh. He’s been featured in two commercials and an online video (just check it out below). He’s a regular celebrity, and you can tell because Halloween Smiley now even has his own t-shirt (he’s gone commercial). If you’re a fan of the Halloween Smiley Cookie and want one of these beauties, you can find them in infant, child, and adult sizes all through October in some of our restaurants (click here to see which ones) and in our online store. If you check out my bio, you'll find a picture of me with last year’s version standing next to Smiley himself (yes, I’m a big fan). I hope you and your family have a wonderful Halloween and Fall, and I hope I see you at Eat’n Park soon! P.S. Busy schedule this Halloween? Let us do the cooking. Here's a special treat (no tricks! ): 20% off your takeout purchase, valid Friday 10/30 and Saturday 10/31/2009 only. Enjoy!